Rising Stars Win Celebrates Company’s Push to Deliver Cutting-edge Innovations Powered by deepsense.io’s Disruptive Big Data Analytics Product Seahorse. deepsense.io, a pure Apache Spark company providing code-free data manipulation and predictive analytics, is proud to announce that its parent company CodiLime has won the Rising Stars Award and was ranked 2nd among all the companies in Central Europe considered for this special category at the prestigious 2015 Deloitte Technology Fast 50 in Central Europe. CodiLime was the second fastest-growing technology company, recording a 2,506% increase in revenues between 2012 and 2014. Subsequently, the company is automatically nominated to be recognised as one of the fastest growing technology companies in Deloitte’s EMEA Technology Fast 500™. The Fast 50 ranking is in its 16th edition in Central Europe, the report and ceremony was organized by Deloitte in Warsaw, together with Warsaw Stock Exchange among others. The Central Europe Technology Fast 50 ranks the region’s fastest-growing tech companies, based on revenue growth over a four-year period. For the 2015 Rising Stars ranking, revenues from 2012 to 2014 were analysed. Nominees in the Fast 50 are judged based on their revenue growth, innovation and technology development. 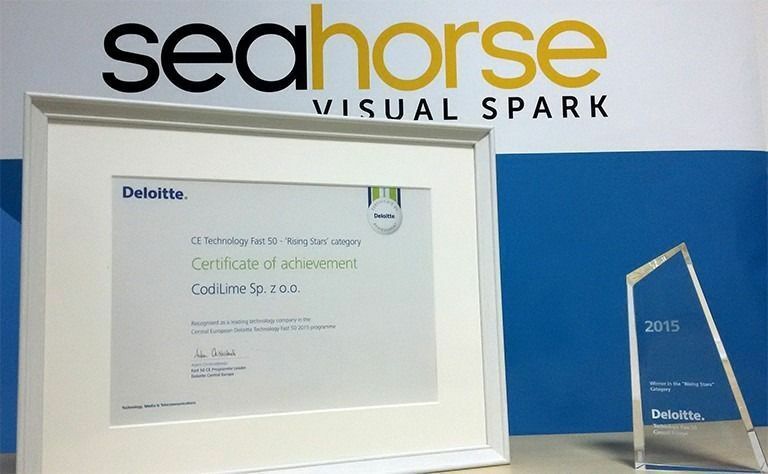 Being awarded and recognized among Deloitte’s 2015 Rising Stars exemplifies CodiLime’s continued push to deliver relevant and marketable technology. New strategic partnerships and the recent launch of Seahorse Community Edition by deepsense.io, show the major milestones that are achieved by the company, and further attest to the progress that management has made. This is the latest in a long list of achievements for CodiLime, with recognition in past years including EY Entrepreneur of the Year and TechCrunch DISRUPT Pitch-off Winner as well as strategic partnerships with Intel, Hortonworks and Mirantis. Read the full 2015 Deloitte Technology Fast 50 Central Europe report. The Deloitte Technology Fast 50 in Central Europe is a programme that recognizes and profiles fast growing technology companies in the region. The programme, which is now in its 16th year, ranks the 50 fastest growing public or private technology companies based on revenue growth over a four-year period. For the 2015 ranking, revenues from 2011 to 2014 were analysed. Deloitte Central Europe is a regional organisation of entities organized under the umbrella of Deloitte Central Europe Holdings Limited, the member firm in Central Europe of Deloitte Touche Tohmatsu Limited. Services are provided by the subsidiaries and affiliates of Deloitte Central Holdings Limited, which are separate and independent legal entities. Deloitte provides audit, tax, consulting and financial advisory services to public and private clients spanning across multiple industries. With a globally connected network of member firms in more than 150 countries, Deloitte brings world-class capabilities and deep local expertise to help clients succeed wherever they operate.